Good food takes time to cook...please have a drink & relax while you wait for the chef to prepare the meal. We're also having a potluck lunch, send in your x0xb0x tracks so others may eat. We had most of the samples cached on a computer (if you have the rest of them, please forward them along so that this table can be completed) so here's a mirror of that page. Of course, we also added the x0xb0x! The last few months a various range of analog and pseudo-analog gears came out. 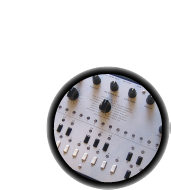 Some of them were sold as machines able to emulate the rather unique TB-303 sound. Here are a few comparative sounds from those emulators (22khz - 8bits - mono). For each machines you have 3 types of sound, and those types are the same for all machines (same notes, at least ...). Here are two pattern loops (stereo 192kbs MP3). The patterns were programmed into a x0xb0x and orignal (unmodified) Roland TB-303, which were DINSYNC'd together. The two were then tweaked in unison and recorded with one acting as left channel output and one acting as right channel output. To play, listen to both using an MP3 player where you can 'pan' the balance of left/right channels. Then vote in the forum on what you think is the configuration we used. Both files have the same configuration. Get updated with more tracks as I add them to the x0xb0x 'podcast' by adding it to your RSS feed, or directly into iTunes, or just check out the x0xb0x tracks site when you're bored. Here are a bunch of videos of people & their x0x, makin' love the acid way - all from youtube. Post some of your own and send the link my way to get featured! the resonance boost is particulary interesting - the filter can self-oscillate quite strongly when the boost amount is set to max. the audio isn't that perfect - i couldn't find good mp3 settings and i tried a lot. anyway, it shows x0xb0x is a fine acid machine"
Dr. Rek's acid setup, including a x0xb0x: "Dr. Rek's acid set features a Korg ES-1, x0xb0x 303, roland tr-606, bent speak n read with pitch CV in recieving pitch from 303, and the long awaited return of the circuit bent video painter mark 3 interpreting the music into bent visuals, for live sets and acid jamz, visit http://absurdity.biz/live.html"
More from Dr. Rek: "6/18/06 at drexrekker's house in tempe,AZ. featuring the setup described in this previous video http://www.youtube.com/watc... This is live acid, no laptop, only circuits, next step will feature modded 606 and light sensitive circuit costume, coming soon. Visit Absurdity.Biz for bookings." More from Suit&Tie Guy: " This is a two-bar loop of the basic "Chameleon" bassline sequenced in a x0xb0x used to control the Minimoog's oscillators and the envelopes, VCA, and Post-Lawsuit Lowpass Filter of the STG Soundlabs Radiophonic Accessory System. the Minimoog's filter is opened up and the bottom C is held down with half of the Hamtech Sonic Screwdriver in order to stay in tune, then fed into the Post-Lawsuit Lowpass Filter, VCA, and an attenuator as a volume control."